President Pranab Mukherjee presenting Ati Vishisht seva medal at Rashtrapati Bhawan in New Delhi. 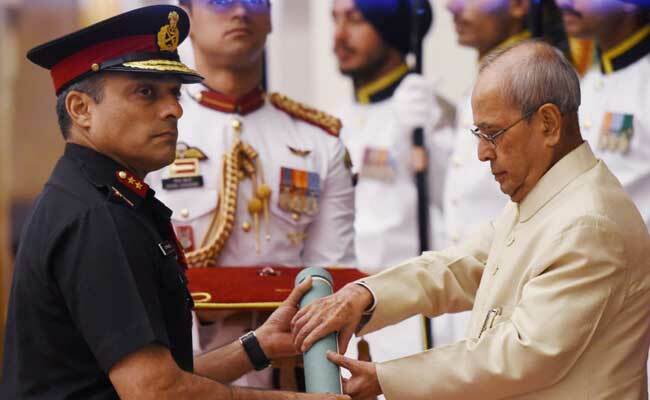 New Delhi: President Pranab Mukherjee on Thursday awarded Shaurya Chakras to the officers who took part in the surgical strike across the Line of Control last year. He also awarded the Shaurya Chakra posthumously to Lieutenant Colonel Niranjan Ek, martyred while recovering an improvised explosive device from the bodies of Pathankot terrorists in January 2016. As per the citation against Shaurya Chakra awardees, Major Rajat Chandra killed two terrorists during the surgical strike, while Captain Ashutosh Kumar neutralised four terrorists. Both belong to 4 Para Special Forces, which took part in the surgical strike in September last year. Major Deepak Upadhyay and Paratrooper Abdul Qayum, both of 9 Para Special Forces, were also awarded with Shaurya Chakras for their role in the surgical strike. Nineteen soldiers of the 4 and 9 Para, the special forces units, who undertook the surgical strike across LoC, were awarded with gallantry medals on January 25, including a Kirti Chakra, while their commanding officers have been given Yudh Sewa Medal. Shaurya Chakra was also posthumously awarded to Sanjewan Singh, head constable with the Jammu and Kashmir Police, Naib Subedhar Kankara V Subba Reddy, Naik Pandurang Gawande, and Kirti Chakra to Lance Havildar Prem Bahadur Resmi Magar of the Gorkha Rifles. All were martyred fighting terrorists. Lieutenant General PM Hariz was awarded Param Vishisht Seva Medal. Mr Hariz is the Commander-in-Chief of the Southern Command. Shaurya Chakras were also awarded to Atu Zumvu, Sub-Divisional Police Officer with the Nagaland Police, who shot down three National Democratic Front of Bodoland (NDFB) outfit members, responsible for killing 81 people.